Grief Resources | Shared Sorrows: Caring People, Resources and More. They say Bethany Hamilton has saltwater in her veins. How else could one explain the passion that drives her to surf? How else could one explain that nothing—not even the loss of her arm—could come between her and the waves? That Halloween morning in Kauai, Hawaii, Bethany responded to the shark’s stealth attack with the calm of a girl with God on her side. Pushing pain and panic aside, she began to paddle with one arm, focusing on a single thought: “Get to the beach....” And when the first thing Bethany wanted to know after surgery was “When can I surf again?” it became clear that her spirit and determination were part of a greater story—a tale of courage and faith that this soft-spoken girl would come to share with the world. From O magazine to the New York Times, from authors such as E. L. Doctorow to Ann Beattie, critics and writers across the country have hailed Roger Rosenblatt's Making Toast as an evocative, moving testament to the enduring power of a parent's love and the bonds of family. When Roger's daughter, Amy—a gifted doctor, mother, and wife—collapses and dies from an asymptomatic heart condition at age thirty-eight, Roger and his wife, Ginny, leave their home on the South Shore of Long Island to move in with their son-in-law, Harris, and their three young grandchildren: six-year-old Jessica, four-year-old Sammy, and one-year-old James, known as Bubbies. Long past the years of diapers, homework, and recitals, Roger and Ginny—Boppo and Mimi to the kids—quickly reaccustom themselves to the world of small children: bedtime stories, talking toys, play-dates, nonstop questions, and nonsequential thought. Though reeling from Amy's death, they carry on, reconstructing a family, sustaining one another, and guiding three lively, alert, and tenderhearted children through the pains and confusions of grief. As he marvels at the strength of his son-in-law and the tenacity and skill of his wife, Roger attends each day to "the one household duty I have mastered"—preparing the morning toast perfectly to each child's liking. Luminous, precise, and utterly unsentimental, Making Toast is both a tribute to the singular Amy and a brave exploration of the human capacity to move through and live with grief. This comprehensive resource provides developmentally appropriate interventions for counseling children and adolescents who have experienced a wide range of grief and loss, including secondary and intangible losses such as moving or divorce. The book synthesizes current research and best-practice approaches for counseling youth. It provides a method for assessing individual needs and offers guidelines for selecting appropriate counseling strategies. This is one of the first books to present a systematic treatment approach, grounded in cognitive-behavioral therapy, for traumatized children and their families. Provided is a comprehensive framework for assessing posttraumatic stress disorder, depression, anxiety, and other symptoms; developing a flexible, individualized treatment plan; and working collaboratively with children and parents to build core skills in such areas as affect regulation and safety. Specific guidance is offered for responding to different types of traumatic events, with an entire section devoted to grief-focused components. Also addressed are ways to tailor treatment to children's varying developmental levels and cultural backgrounds. The authors' approach has been nationally recognized as an exemplary evidence-based program. Drawing upon extensive interviews and assessments of school-age children who have lost a parent to death, this book offers a portrait of the mourning process in children. The volume presents major findings from the Harvard Child Bereavement Study and places them in the context of previous research, shedding new light on both the wide range of normal variation in children's experience of grief and the factors that put bereaved children at risk. The book also compares parentally bereaved children with those who have suffered loss of a sibling to death, or of a parent through divorce, exploring similarities and differences in these experiences of loss. A concluding section explores the clinical implications of the findings and includes a review of intervention models and activities, as well as a screening instrument designed to help identify high-risk bereaved children. Following a life shattering experience, a child enters upon a confusing emotional journey that can be likened to a prism of many colors of dark feelings like sadness and fear, but also warm feelings of love and courage. The way they deal with these feelings has a lasting impact on their life as they grow. The Colors of Grief explores strategies for supporting a grieving child to ensure a healthy growth into adulthood. Drawing on the latest research in neurology and psychology, Janis Di Ciacco illustrates the childa? ?s grieving process using a model of development that employs a? ?key stagesa??. These range from preverbal infancy (0a? ?2 years) through to early adulthood (about 25 years). She shows how a childa? ?s progress through these stages can be impaired by an early encounter with loss, which can contribute to cognitive, emotional and social difficulties. Drawing connections between bereavement, attachment issues and social dysfunction, the author suggests easy-to-use activities for intervention at each key stage, including infant massage, aromatherapy and storytelling. This is a revealing and accessible book for both parents and professionals working with, or caring for, bereaved infants, children or young adults. The wait is over. For the first time ever, experience the majesty of Disney’s epic animated masterpiece as it roars off the screen and into your living room on Blu-ray and Blu-ray 3D. With a spectacular digital picture, spine-tingling high definition sound and immersive bonus features—you will feel the love for this critically acclaimed and universally beloved classic like never before. Embark on an extraordinary coming-of-age adventure as Simba, a lion cub who cannot wait to be king, searches for his destiny in the great “Circle of Life.” You will be thrilled by the breathtaking animation, unforgettable Academy Award®–winning music (1994: Best Original Score; Best Song, “Can You Feel The Love Tonight”) and timeless story. The king of all animated films reigns on Disney Blu-ray 3D—magic in a new dimension. Hang on for the ride of your life as Walt Disney Pictures presents the action-packed adventure that delivers thrilling heroics and rugged scenery! Based on an incredible true-life story, a brave young man is thrust into adulthood as he and his courageous team of sled dogs embark on a grueling and treacherous cross-country marathon. Together they race through the frozen wilderness, carrying hopes of capturing the $10,000 grand prize that will save his family from financial ruin. With dogged determination and sheer iron will, they face impossible odds and hardships along the dangerous trail to his dreams. IRON WILL is high adventure that will thrill and uplift everyone! An inspiring educational DVD using creative art techniques to aid in the process of healing grief. Therapeutic art techniques demonstrated and explained through real client case studies. 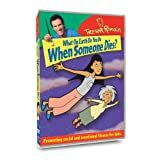 This DVD can enhance the work of Psychologists, Counselors, Social Workers, Teachers, Creative Therapists and benefit anyone who has experienced their own loss. An honest and intimate look at the complexities of grief and healing, "Motherland" is about resilience, triumph of the human spirit and the power of unconditional love. It also reminds us of the vastly different ways in which disparate cultures confront personal loss. Each year over eight million families around the world suffer the loss of a child. In Jennifer Steinman's moving and inspiring documentary film, a 17-day trip to South Africa transforms the lives of six grieving mothers from across the US. Unexpectedly and eight thousand miles from home, each finds comfort and healing in a landscape that appears, at first, to offer little more than melancholy. Prior to their journey, the six women have each suffered the death of a child, but otherwise have little in common. And although the anticipation of a long, emotional journey with a group of strangers evokes anxiety, the women all share a desire to make sense of their tragedies and to move forward with their lives. Insightful and straightforward, this animated program from Trevor Romain helps kids understand how death is a natural part of life through discussing the importance of grief and offering tips on how to cope with the loss of a loved one. 25 min. Soundtrack: English; featurettes; interview; music videos.